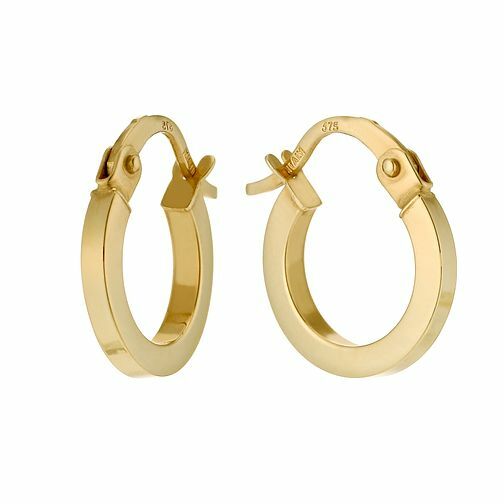 Keep it simple and sophisticated with this elegant pair of 9ct gold 8mm creole earrings. A versatile accessory, perfect for everyday chic. Elegant jewellery for the modern style conscious woman. 9ct gold plain round creole earrings 8mm is rated 4.5 out of 5 by 11. Rated 5 out of 5 by Anonymous from Good product I brought these earrings for my daughter, who is in the habit of either losing them (as the catch gives way) or breaking them because they are flimsy. I have been really impressed with the quality of the earrings which are study and pretty. Well worth the few extra pounds compared to others made by competitors. Rated 5 out of 5 by Anonymous from Beautiful earrings I love my new gold hoop earrings. They are better than I expected when I was ordering online .